The Tatoosh Range is a mountain range located in Mount Rainier National Park and the adjacent Tatoosh Wilderness in the state of Washington, in the Pacific Northwest region of the United States. The range runs roughly east–west, beginning with the southeastern Moon Mountain and concluding with the western Rainbow Mountain and Eagle Peak. The range includes 25 prominent named peaks. The peaks average nearly 6,420 ft (1,960 m) in summit elevation, with the highest, Unicorn Peak, measuring at a height of 6,971 ft (2,125 m). Visitors to Mount Rainier can view the range from the Paradise area, and the range is popular with hikers. Several of the peaks, as viewed from Paradise. While some of the peaks, including the distinctive Unicorn Peak, are named for their appearance, others are named in honor of notable individuals. Lane Peak, for example, honors Franklin Knight Lane, former United States Secretary of the Interior. 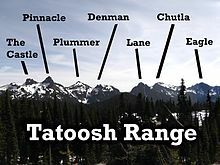 Like other ranges, the Tatoosh Range has seen its share of casualties. In 1924, an assistant mountain guide named Paul Moser fell to his death attempting to scale Unicorn Peak by a new route. In 2004, 16-year-old Vasiliy Kozorezov fell and died while hiking off-trail below the Eagle Peak Trail. Unexpected or extreme weather conditions can also cause problems. In 1946, heavy fog caused park employees Donald Carlson and James Pratt to get lost in the range for two days, but as the weather improved, they were able to find their way back. In 1910, a USGS crew made the first recorded summit of the peaks. In the 1920s and 1930s, farmers regularly let their cattle graze along the Tatoosh Range. In 1937, attempts were made to film the movie Thin Ice on location, but blizzards made it impossible, so the crew and actors Tyrone Power and Sonja Henie returned to California to shoot the movie in a studio, while director Dave Butler and a cameraman stayed behind to collect footage of the Tatoosh Range to use for the background images. During the summer, the Tatoosh Range is a popular attraction for hikers. From within Mount Rainier National Park, the range can be accessed from Eagle Peak Trailhead, Pinnacle Peak Trailhead, and Snow Lake Trailhead. 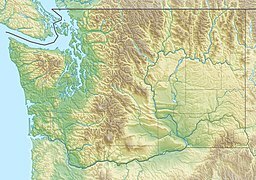 Tatoosh Peak and Butter Peak are located outside of Mount Rainier National Park, but may be accessed from the Tatoosh Wilderness Area. Some peaks are able to be reached by hillwalking, while others can only be summited on alpine routes by scrambling and rock climbing. In the winter, the range is used by skiers and snowshoers. ^ a b c d e Mandrake. "Tatoosh Range." SummitPost.org, 2006. Accessed on July 15, 2011. ^ a b "Park Map." Archived 2005-09-03 at the Wayback Machine National Park Service. Accessed on July 15, 2011. ^ "Building isn't quite paradise." Eugene Register-Guard, June 14, 1999. Accessed on July 15, 2011, from Google News Archive. ^ "Named in Lane's Memory." The New York Times November 5, 1921. Accessed on July 15, 2011, from Google News Archive. ^ "Mountain to Be Lane Memorial." The Milwaukee Journal, June 25, 1921. Accessed on July 16, 2011. ^ "Mountain Guide Falls to Death." Spokane Daily Chronicle, August 23, 1924. Accessed on July 15, 2011, from Google News Archive. ^ "Youth, 16, falls to his death in Mount Rainier park." The Seattle Times, November 14, 2004. Accessed on July 15, 2011 from Google News Archive. 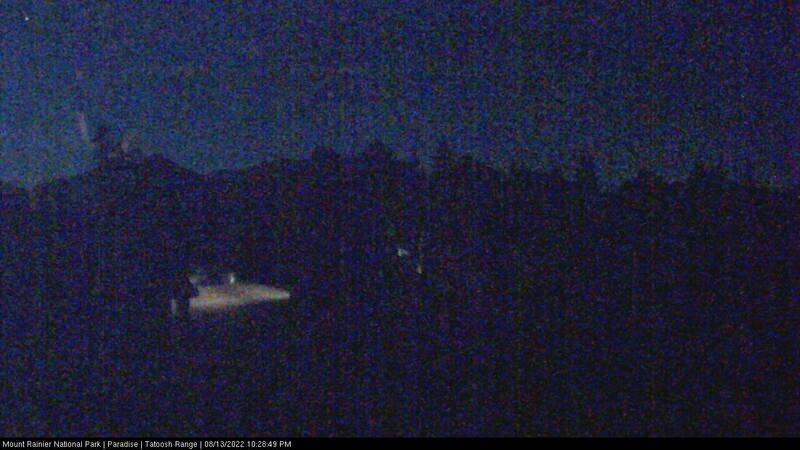 ^ "Missing Rainier Employes Return." Ellensburg Daily Record, August 17, 1946. ^ Nelson, Jim, and Potterfield, Peter. Climbs in the Cascades: Alpine routes, sport climbs & crag climbs. The Mountaineers Books, 2000. Accessed on July 18, 2011. ^ "Room Improvement Club Prize." The Chehalis Bee-Nugget, Octer 23, 1925. Accessed on July 15, 2011, from Google News Service. ^ "Revival Meetings at Randle." The Chehalis Bee-Nugget, July 3, 1931. Accessed on July 15, 2011, from Google News Service. ^ "Mountain Won't Be Movie Actor; Company Leaves." Ellensburg Daily Record, April 9, 1937. Accessed on July 16, 2011, from Google News Archive. ^ King, Gordon. "Backcountry skiers glide across a semi-melted lake." Seattle Times, September 5, 2009. Accessed on July 15, 2011. ^ Sykes, Karen. "Hike Of The Week: A peaceful path to a lofty perch." Seattle Post-Intelligencer, December 8, 2004. Accessed on July 15, 2011, from Google News Archive.